One of the amazing things of this project is the possibility to include the music teaching as a part of the normal school routine. The teachers of the class have been really supportive and I am hoping to be able to have continuous reflective conversations about this activity and how to improve its functionality within normal school day. 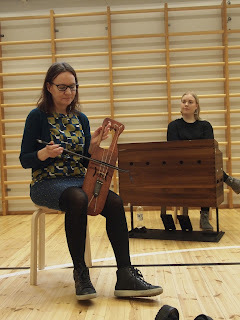 For me, there is also interest in research as I started my PhD in Music Education this year; I am fascinated about different embodied methods to be used as a support for academic learning. As I am convinced that our bodies play a very crucial role in the learning process I am hoping to be able to use methods that utilize this quality in practice with this group. As I am concentrated on literacy skills (reading and linguistic skills) in my research, I am keen in finding new (or old- new for me!) ways to enhance childrens ability to learn (Finnish) language. I've designed the lessons in a way that they will always include movement as part of the learning process- further on in spring semester I am aiming to concentrate more on some specific methods and will fill in the information about those in here also.